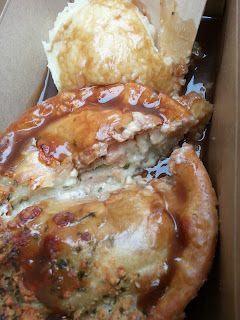 My quest to try every pie in the Pieminister range led me to their Pieminister Leather Lane store. Here they have a lovely wide range of pies, albeit at a bit of a premium price of £6 for a pie and gravy. So you think you've tried the full Pieminister range in the supermarket? Think again. Their supermarket offerings are just the tip of the iceberg. The great thing about the store is that you can find some of their rarer pies that you're less likely to come across in the high street supermarket. One such 'rarer' pie is the Pietanic fish pie. It contains smoked haddock, salmon, pollock and prawns in a creamy sauce - but the BIG selling-point of this pie is that, unlike most other fish pies that are topped with mashed potato, the Pietanic has a filling that is totally and wholly encased in pastry. Of course, according to the British Pie Awards, this makes it a true pie. As I've already mentioned, it's £6 for a pie and mash. But seeing as we're a "pie review website" and not a "pie-and-mash review website", I'll tell you that the price for the pie alone is £4.20. This seems to be only a modest mark-up from the £3.50 you'd expect to pay in a supermarket - and you can buy the pies from the Leather Lane store cold for £3.50 too. So £0.70 to have the pie heated and boxed for you seems quite reasonable actually. I really like the look of this pie, and I love the fact that it comes in a take-away box that feels warm in my hands (it's cold outside). The pie is golden, and the condition is good. As I cut through the pie with my wooden take-away knife, I note that the pastry is crispy and crunchy - in true Pieminister style. I was quite intrigued as to what fish encased in pastry was going to taste like, but it was very nice. The fish tasted fresh, and the sauce was creamy. The pastry was nice and crunchy, and not chewy. The pie was well filled and had good capacity. The consistency Pieminister have shown in producing enjoyable pies is really quite commendable. I have to give them extra points to for not being tempted to top their fish pie with mash.